Greetings fellow yogis and yoginis. Last week we discussed the Five Yamas. The Yamas are the first limb of Patanjali’s 8 limbs of Yoga, or Ashtanga. Understanding each limb will help you learn to live a more purposeful and ethical life. This week, we’ll be diving into the second limb of Ashtanga, the Niyamas. While the Yamas focused more on our relationships with others, the Niyamas examine our relationship with self. Niyamas pertain to our personal observances and self-discipline. Saucha - The first Niyama focuses on achieving and maintaining purity. Purity, in this sense, can be understood as freedom from uncleanliness as well as immorality. The goal of Saucha is to maintain purity internally as well as externally. Ways that we can maintain purity externally include showering and maintaining personal hygiene as well as a healthy diet. Internally, meditation is a great way to maintain purity. It is also important to monitor the friends that you bring into your life and your home and to be careful to avoid negative energy that could alter the state of your internal purity. Santosha- The second Niyama teaches us to practice contentment. It is easy to always want more. Many times all we can think about is moving into a bigger house, getting a nicer car, getting a better job etc. 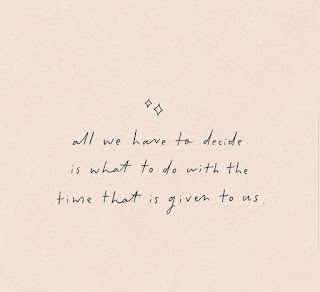 and in the process we forget to appreciate what we already have. Santosha teaches us to enjoy living in the moment and to be appreciative of everything that life has given us. To practice Santosha is not to lack ambition, but rather to appreciate the journey and to be grateful for every gift, big and small, that life gives to us. Tapas- The third Niyama teaches us to practice self-discipline and to find and develop our will power. To practice Tapas is to avoid doing things that your mind desires but that you know will not benefit you and to do things that run contrary to your minds desires but that you know will benefit you. When there is a conflict between our will and the desires of our mind, that friction sparks an internal fire. That fire can be used to burn out impurities and also to serve as an energy source to help keep us motivated and dedicated to our practice of yoga. 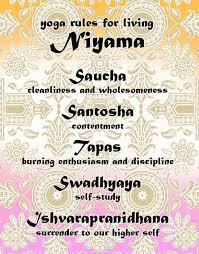 Svadhyaya - The fourth Niyama is the practice of self-study. The goal of Svadhyaya is to be able to discover our strengths and weaknesses through self examination. If we take the time to examine our behavior juxtaposed to our desires, our thoughts and our will, then we can determine what stands in our way of becoming the most pure person that we can be. Ishvara Pranidhana - The final Niyama teaches us devotion. It requires us to practice Karma yoga and also to surrender. To practice Ishvara Pranidhana is to surrender the fruits of our practice to a higher power. Whether that higher power represents a deity or a universal energy or whatever the word higher power means to you, you must selflessly offer the benefits of your practice to something greater than yourself. Ishvara Pranidhana also teaches us to dissolve our identification with self along with our egocentric nature. Understanding the five Niyamas as well as the Yamas lays a great foundation for continuing your journey on understanding Ashtanga as a whole. 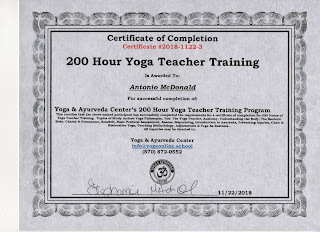 I hope that you found this post interesting and I look forward to providing more information pertaining to Yoga psychology in the coming weeks and over the course of the year. If you’re interested in learning more about Yoga philosophy at your own pace, please visit our website and view our online teacher training or yoga philosophy class offerings.